On this page you will learn how to update firmware inside ATMEGA16U2, so it becomes "AVRISP MKII" programmer. Then we will use it to program ATMEGA328P chip. You can do similar steps also with your Arduino Uno R3 board, that's how I initially tested it. How does it work: There are two microcontrollers on the 28Pins - ATMEGA16U2 (16U2) and ATMEGA328P (328P). In the "Arduino" compatible mode, 16U2 works like USB to Serial translator. However, by changing the firmware inside 16U2, we can make it to become a programmer or even a debugger. For example, when we put AVRISP MKII firmware inside the 16U2, then it becomes AVRISP MKII programmer and 16U2 can be used to program other chips through ICSP1, even the 328P on board microcontroller. In this case, connect ICSP1 header to your target and be sure the JP3 jumper is placed on the pins 2-3 (JP3 will connect PB4 pin of 16U2 to the ICSP1 header, so 16U2 can drive RESET signal of the connected device). 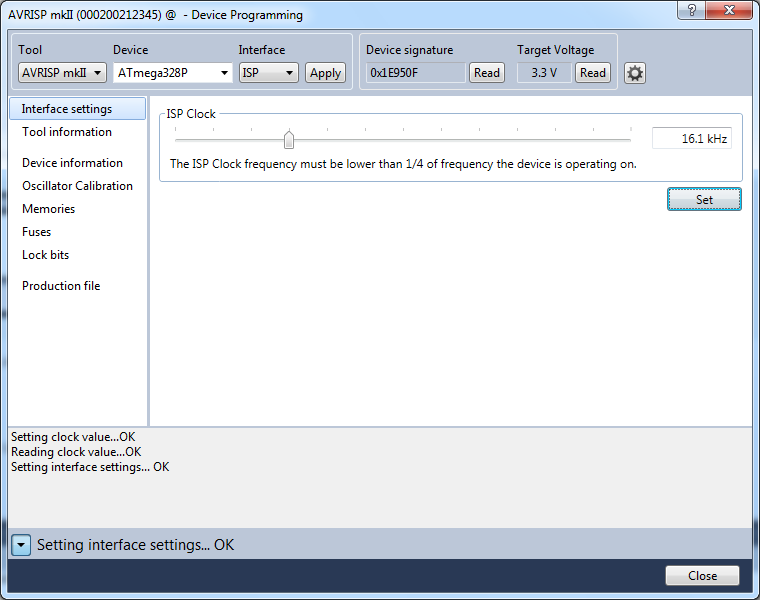 Then just use Atmel Studio (or other software) to program the target. Below are the exact steps how to do it. Fit a Link on ICSP1 to short pins 5-6 (this link shorts 16U2 RESET to GND). Unfit the ICSP1(5-6) Link. 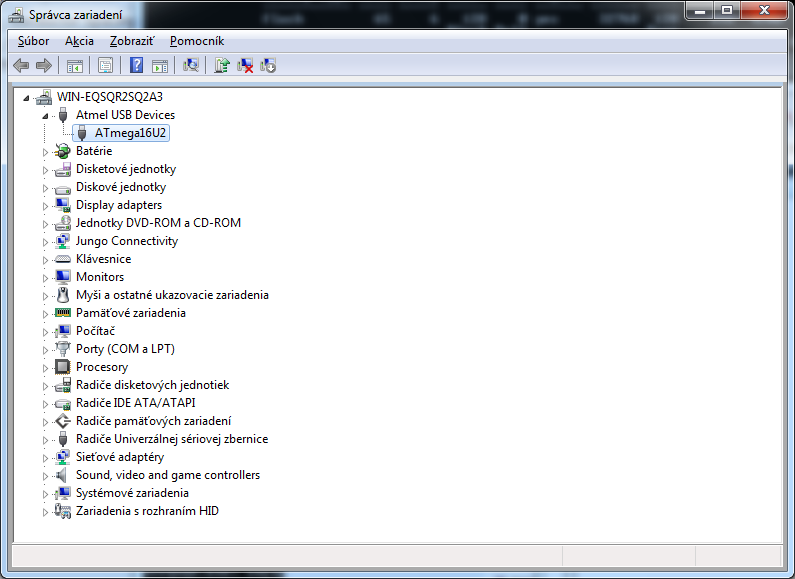 A new USB device should be recognized (16U2 is in DFU mode). You are now ready to flash ATMEGA16U2. Download AVRISP MKII hex file. This is important: There are three different AVRISP MKII hex files on the Internet - one is for Avrdude (also used by Arduino), one is for ATMEL Studio and one is for BOTH. We will use the firmware for BOTH. Note: I created this hex file from LUFA Project. Check out Appendix how you can compile it by yourself. Disconnect 28Pins from the USB cable. The 16U2 now becomes AVRISP MKII. Disconnect the USB cable. This is the tricky part and I spent quite a time to figure it out how it works. The problem is, that you may want to use two different drivers: one for Avrdude (used by Arduino) and a different driver for Atmel Studio. To make it even more complicated, there is some incompatibility between different Avrdude versions (the LUFA AVRISP MKII firmware may not work with the Avrdude 6 version, see this Avrdude Bug #40831). 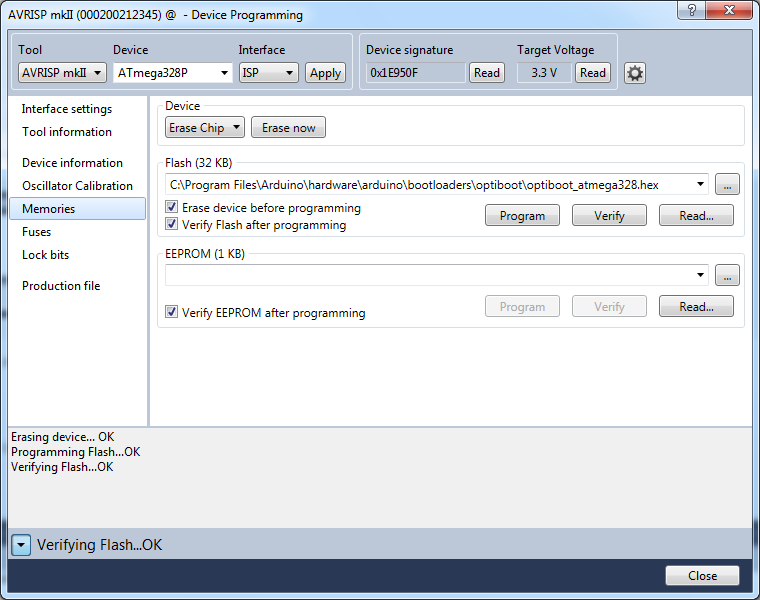 In the next steps I described how to use Atmel Studio. Note: You can switch between Atmel Studio and Avrdude mode. Each time the 16U2 is reset externally via the reset pin (ICSP1 pins 5-6, JP1 must be on 1-2), the compatibility mode will be toggled. You can recognize the current mode when you connect the board to USB: RX&TX LEDs will flash twice on startup for Atmel Studio mode, and five times for avrdude mode. 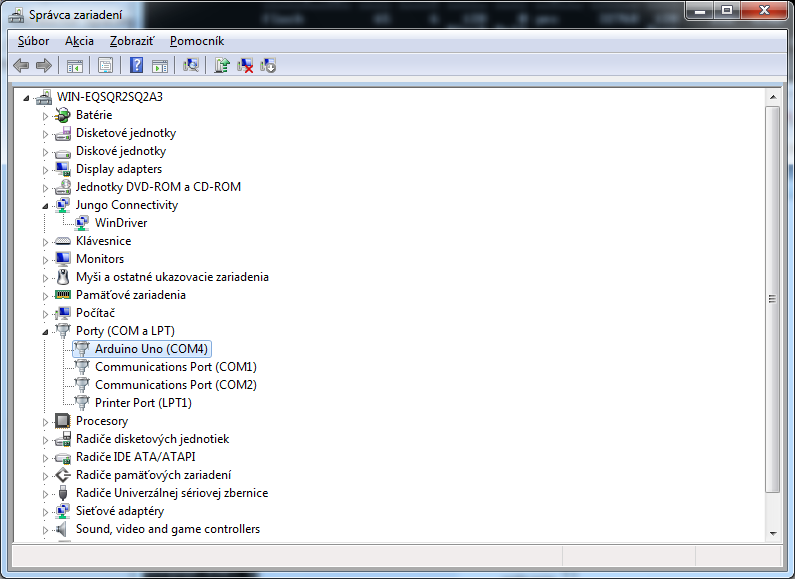 Important: After you flash the LUFA-AVRISP-MKII, the ATMEGA16U2 is configured for ATMEL Studio. After the installation, connect 28pins to the USB cable. Both LEDs (RX&TX) should blink two times (that means, 16U2 is in "Atmel Studio" mode,). A new device will be recognized. Install drivers. If they are not recognized automatically, you will find them in "c:\Program Files\Atmel\Atmel USB Drivers\"
Be sure your 28pins board is correctly recognized and installed for using with Atmel Studio. See the previous steps. Note: I had a look into LUFA AVRISP MKII source code and there is hardcoded maximum waiting time. This means, programming will not work if you set a very low ISP clock speed. You will get error: "ispProgramMem: Error status received: Got 0x81, expected 0x00 (RDY/nBSY pin sampling timed out)". However, the maximum ISP speed is also limited and it can not be more than 1/4 frequency of the device. Done. You have successfully programmed 328P with Arduino bootloader. If you would like to use 28Pins with Arduino Software, read further. You will need to re-flash 16U2 with USB to serial firmware. If you would like to use 28Pins with Arduino software, you will need to flash Serial to USB firmware into the 16U2. We will use FLIP again. Disconnect USB cable and connect it again. A new USB device should be recognized. 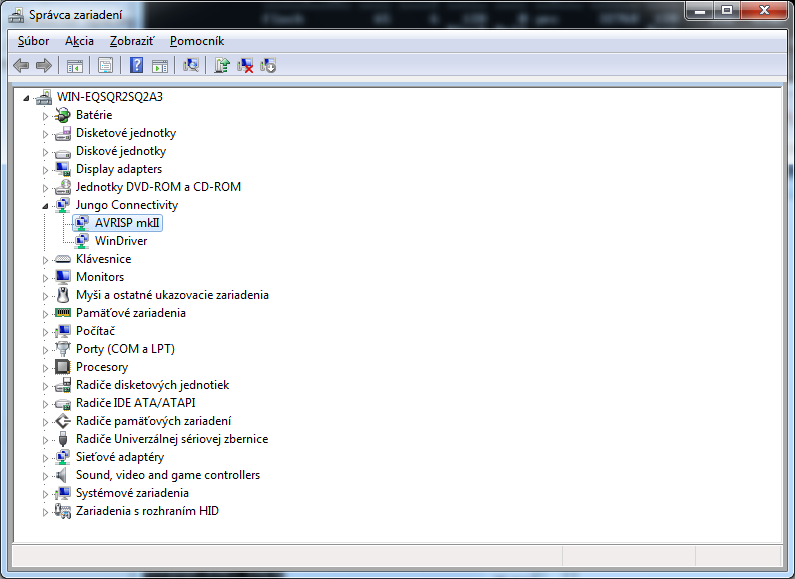 If driver is not installed automatically, you will find it in "c:\Program Files\Arduino\drivers\". Great! We can now test a Blink example. Start Arduino software (Start -> Arduino). Be sure, that JP1 shorts pins 1-2 (Autoreset is enabled). Download VMware player (it's free). Set ‘Release upgrade’ to ‘Never’. Click on ‘Check’ to check for upgraded packages. It will look for packages that are upgraded from the version that is installed on your box. Choose to install the upgrades. This will take a while on a freshly installed box. 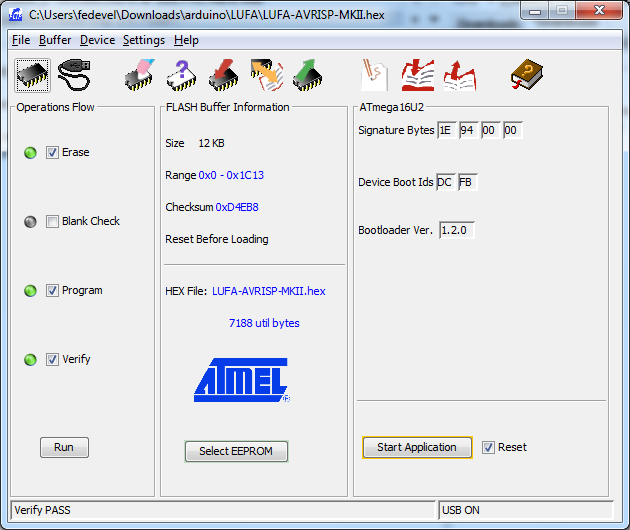 To compile an AVR source code, you will need to install Atmel AVR Toolchain. Go to http://www.atmel.com/tools/atmelavrtoolchainforlinux.aspx and download the toolchain. To generate the AVRISP MKII hex file, we will need to download LUFA source codes, modify AVRISP MKII project and compile it. [INFO] : Finished building project &amp;amp;amp;amp;amp;quot;AVRISP-MKII&amp;amp;amp;amp;amp;quot;. # Copyright (C) Dean Camera, 2014. # Run &amp;amp;amp;amp;amp;quot;make help&amp;amp;amp;amp;amp;quot; for target help. [INFO]    : Finished building project &amp;amp;quot;AVRISP-MKII&amp;amp;quot;. Note: Initially 16U2 will run in the Atmel Studio mode, if you would like to change it, Fit and Unfit a Link on ICSP1 between pins 5-6 (this will reset the 16U2 and it will change the mode, you will see the LEDs blinking 4-5 times). If you are using Arduino Uno R3, you will need to pull HWB pin to +5V before you use the Reset Link, otherwise your 16U2 will go into DFU mode and will not toggle between Atmel Studio and Avrdude mode.